Less than two weeks after its iOS launch, intelligent news app NewsBrain has received an update that allows it to read news articles aloud to you. To activate NewsBrain’s text-to-speech capability, simply tap the “share” button or press and hold on an article, before selecting the “speak” option — letting you get caught up with your reading while, for instance, jogging or driving to work. As developer Leptonic Systems notes, the text-to-speech functionality is fully customizable — with the option of showing article images on your iOS device lock screen, or else showing the text as it’s being spoken. Users can additionally adjust the speech rate, or choose the parts of the article that are read to you. To pause, just touch the screen, or swipe to skip to the next article NewsBrain predicts you’ll be interested in. Improved readability where text overlays an image. The Article Screen text overlay doesn’t use more area than necessary. The Article Screen shows more text when an article has no image. The Article Screen on iPhone has less clutter, won’t show over 3 articles at once. Addressed an issue of hanging when fetching from an empty page. Addressed an issue where Cancel was unresponsive on an option screen. Addressed a crash that could occur during article evaluation. A few more text styles were added. 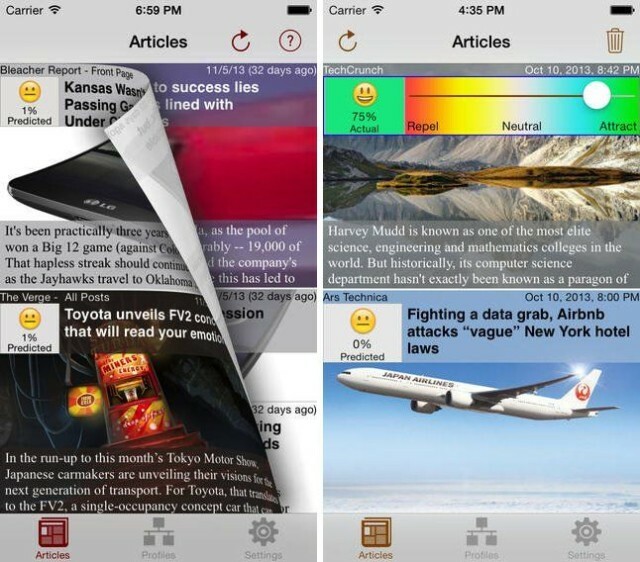 NewsBrain is available in the App Store at a cost of $4.99. The update is free to existing users.